The night eagle, at home in the dark, the owl is one of great intuition and wisdom. Owl asks us to use the power of keen, silent observation to determine true motive. This design is carved in the Fremont Style. Approx. size 5" x 7" x 1/4". Also available in small size. Your artwork may be hung on your wall, with the nail provided, or used with thestand that comes with each piece. A nail in a piece of drywall will support approximately 20 pounds. 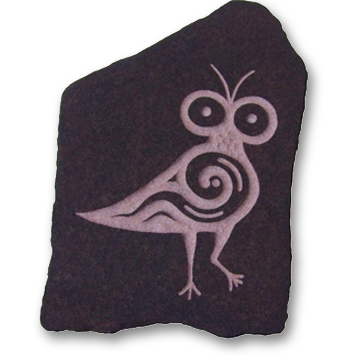 Our stone carvings weigh less than 8 pounds each. Just hammer the nail into the wall as if you were going to hang a picture (at approximately a 45 degree angle). Then pull the nail out as far as you can without removing it from the wall. Line the hole on the back of the rock up with the nail and push the rock onto the nail and towards the wall until it is flush with the wall. This ensures that the nail is all the way inside the hole on the rock. When removing the rock from the wall lift it upward to free it from the nail. Ron has taken great care to balance the stones so that they will hang accurately on the wall. To stand the piece just place the rod into the hole on the back. The artwork will be supported by the pressure created when leaning back on the rod. Description card and hanging instructions included.